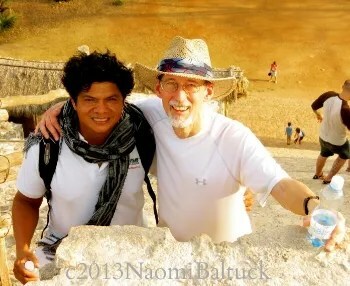 On our recent trip to Mexico, we had a Mayan guide, Murux. 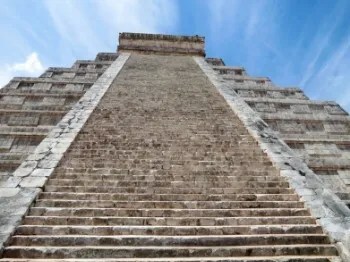 I was worn out with the extreme heat and sun, after walking around Chichen Itza, a huge complex of Mayan ruins. 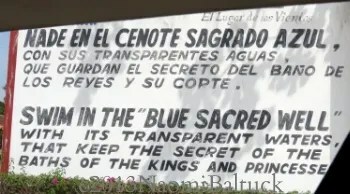 In between visits to Mayan ruins, Murux took us to Cenote Sagrado Azul. 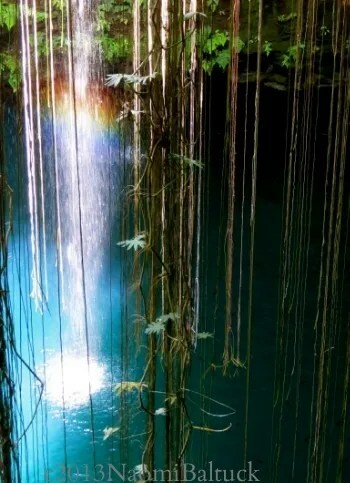 A cenote is a sinkhole or cave providing access to the extensive system of underground and underwater caves beneath the Yucatan Peninsula. 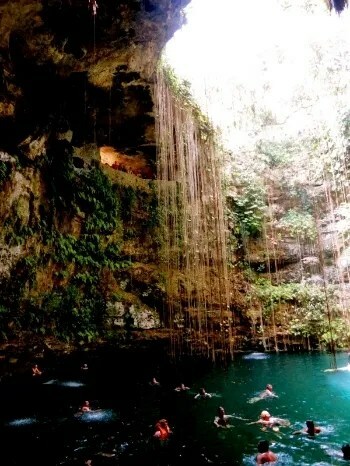 Of the estimated 30, 000 cenotes, a few are open to the public for swimming. 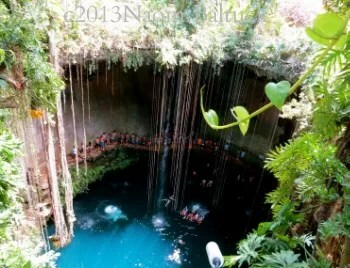 Murux says the Mayans regarded them as sacred entrances to the Underworld. I was a little skeptical when I saw this sign. 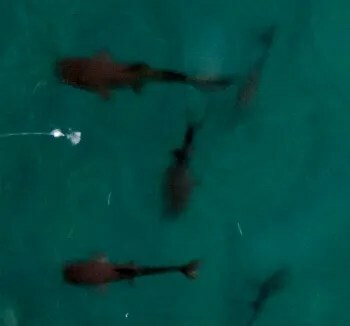 I mentioned once that I only swim in the warm waters off the Hawaiian Islands. I don’t like being cold. Nor do I like public showers, public pools, or making public appearances in my swimsuit. 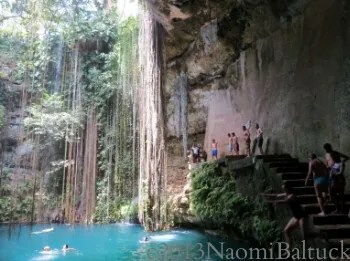 But my husband Thom gave me a gentle nudge (with a sharp stick), and somehow I found myself suited up, reluctantly stepping into the open outdoor shower outside the entrance to Cenote Sagrado Azul. 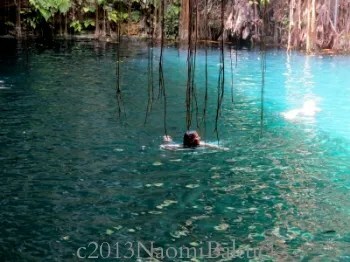 Dripping wet, I walked past the security guard through the archway, and looked down from the rim into the cenote. In that instant, I was transported from the oppressive heat of a dusty dry world into another world entirely. 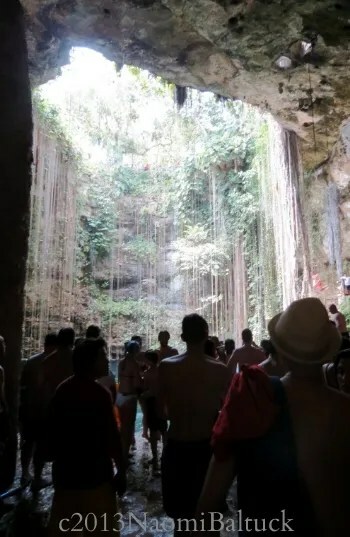 With its hanging vines, watery echoes, and tiny streams dripping down stone walls into a jade pool, it was like a scene from a Tarzan or an Indiana Jones movie. I descended slippery stone steps through a tunnel into the actual cave, along with a swarm of tourists who had just arrived by bus. We all stepped into an underground chamber, open to the sky, with sunlight filtering down through the vines. Stairs hugged the wall, leading up to a ledge where swimmers took turns making flying leaps into the water. 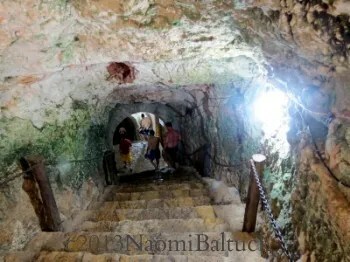 No fear of hitting the bottom—this was the entrance to the Underworld, and it was bottomless. Like a mahout with a stubborn elephant,Thom backed me down the first couple rungs of a small wooden ladder. I was in up to my waist before I balked. A woman, already in the water, said something in Spanish, and she started to peel my fingers away from the ladder. I was shocked at this breach of personal space, and held on even tighter. The woman laughed, and slapped at my hands. It was clear that she wasn’t going to go away, and she wasn’t going to give up. Some part of me really wanted to let go, and I knew I would probably regret it if I did not take that plunge. I released my grip, and splashed backwards into the cool clear water. The word ‘magic,’ is overused. But the ‘M’ word is the only one I can think of to describe that moment, that magic, that Mexico, that me. I surfaced, the woman smiled, and melted into the crowd, like an angel who had come down to earth, completed her mission, and moved on. The tour bus must’ve recalled its passengers, because when I swam out to the center of the pool and looked back, I felt like the only person in a world where time did not exist. It was like learning to breathe again. It was a baptism. It was letting go of the heat, the shyness, the fear. It was a little like falling in love. I am now a believer. And not only in spirit guides. I now know it’s possible to step through the entrance to the Underworld, and exist in that sacred place where kings and princesses bathe and are renewed.